The Summer PowerView Motorization Event! From Saturday Jun 30, 2018 to September 10, 2018, Read Design Plano and Read Design Southlake will host a number of Motorization Events including 2 Thursday "Wine and Design" focusing on PowerView Motorization by Hunter Douglas. There will also be Exclusive Promotions, coupon giveaways, and a drawing at each Store for the New PowerView Hub. Stop by and you will also receive the new Art of Window Dressing Book. With PowerView Motorization from Hunter Douglas, the worlds most beautiful window treatments are now the most intelligent. This innovative wireless system lets you move any powered Hunter Douglas window treatment according to the schedules you set. Perfect lighting, energy efficiency, everyday convenience- its all delivered automatically with PowerView. Whether you want to move the shades up or down, or tilt or traverse them, PowerView Motorization gives you precise and convenient control of your beautiful Hunter Douglas window treatments. With the PowerView App, you can quickly create customized Scenes that control all the shades in your home, operating together or in any combination your desire. Then, just schedule those Scenes to automatically move your shades to your preferred positions. Use PowerView Motorization to move your shades according to the sun 's daily patterns. Having your shades in the right positions can reduce solar heat, gain in the summer and heat loss in the winter, and could help you lower your energy bills. Adjust your shades for added security while you're away via the RemoteConnect texture on your smartphone or tablet. Simple cord-free operation is aesthetically pleasing and safer for homes with children and pets. With the widest array of innovative styles, colors, and fabrics in the industry, Hunter Douglas window treatments embody beautiful form and function. Most PowerView window treatments are battery powered, so they're easy to install, operate, and maintain. The battery pack is hidden behind the Read rail, so there is nothing to mar the beauty of your window treatments. This is the Beginning of PowerView. In a few days you will meet the PowerView Family. But now if you are buying a new home or if you are making improvements to your current home, stop by either Read Design Plano or Read Design Southlake and let our qualified designers show you all of the Window Shadings that can be powered. They can show you fabrics that will work with your life style and give you ideas on how to set your scenes. They can show you the latest trends and current styles. We are a Family business and are excited about all that is new with Hunter Douglas PowerView Motorization. We service all of these areas. Plano, Dallas, Colleyville, Flower Mound, Allen, Celina, Prosper, Southlake, Grapevine, Keller, Richardson, Carrollton, Frisco, Little Elm, Lewisville, McKinney, Preston Hollow, Trophy Club, Fort Worth, Farmers Branch , Park Cities, Rockwell, Roanoke, Arlington and everywhere inbetween. Here in the Dallas, Texas area new homes are popping up everywhere. It is truly amazing. However, sometimes it seems as though the home building are piling these large homes one of top of the other. It almost feels like you can reach your arm out and touch your neighbor! We recently helped a client in Plano who had exactly this problem. Her home is stunning, but the distance between her home and her neighbors was less than eight feet. The view from her three large dining room windows were a brick wall along with the neighbors air conditioner unit and meters. This was definitely an issue as no one wants to look at that mess while eating a lovely family dinner. What a sore sight! Our solution for this bad view is simple. We did not want to cover this windows with blinds or shutters as this was the only light entering this room. We still wanted to keep it light and bright. So instead of putting something heavy, we decided to go with a sheer drapery. It is a dining room, after all, so the drapery is a perfect way to dress up the room and solve the visual issue with the view. The sheer fabric we chose has a delicate pattern for added interest and style. The fabric is from a beautiful line in the Kravet Collection. We used a zip rod from Design Elements so they can pull the draperies open if they want to. This window treatment lets light diffuse into the room while hiding the ugly view and dressing up the room. Style and function! What a beautiful combination. If draperies aren't your thing, there are other window treatment options to explore. If draperies aren't your thing, there are other window treatment options to explore. In a room with more light, you might consider plantation shutters in the 4.5 inch louver. You can tilt the louvers slight to let plenty of light in while still hiding the unwanted view. Keep in mind, shutters will always take away more light because it is a heavy and solid window treatment, so make sure you have plenty of windows and an airy, large room. Another option would be to look into Pirouette or Silhouette Window Shadings from Hunter Douglas. These two unique products offer the versatility and control most people love. In fact these are my absolute favorite window treatments to use in homes and ten times out of ten, my clients are thrilled. Silhouette shades with the Signature S vane will transform light. Fabric vanes float between two sheers that create a beautiful and functional look. This innovative design will defuse light and soften the view outdoors. They allow for daytime privacy and offer 88% UV blockage in the tilted position. Pirouette shades with its striking design will dramatically filter light in a way you've never seen before. Unless, of course, you're familiar with the product! These shades will give you a softened view to the outdoors along with giving you the look of a traditional fabric shade. Both of these beautiful window coverings come in a variety of fabrics giving you many textures and colors to choose from. It is easy to find the right fabric for your space. You might even consider the Duette Architella Honeycomb Shade with the Top Down/Bottom Up design feature. This allows you to lower your shade from the top for maximum privacy as well as blocking unsightly views while offering light control. Duette® Honeycomb Shades are the original cellular shades, specifically engineered to provide beauty and energy efficiency at the window in both cold and warm climates. Their honeycomb construction traps air in distinct pockets, which creates insulation that can help lower your energy consumption and energy bills. Duette shades are available in an expansive range of pleat sizes, fabrics, colors, opacities and textures. Innovative operating system design options such as Top-Down/Bottom-Up and Duette Duolite® make these shades a top choice for any window, skylight or even specialty window shapes like arches, sidelights and circles. The newest option to haze the ugly view would be to use Vignette Modern Roman Shades with the Duolite option. You can use a sheer fabric to distract, but not cut out light. For two opacities in a single shade, consider the revolutionary Duolite® option. Vignette Duolite combines a light-filtering or sheer front shade with a built-in room-darkening back panel both housed on a single roller to easily achieve the perfect level of light and privacy. My favorite fabric in this collection is called Layla and I can't wait to show you! 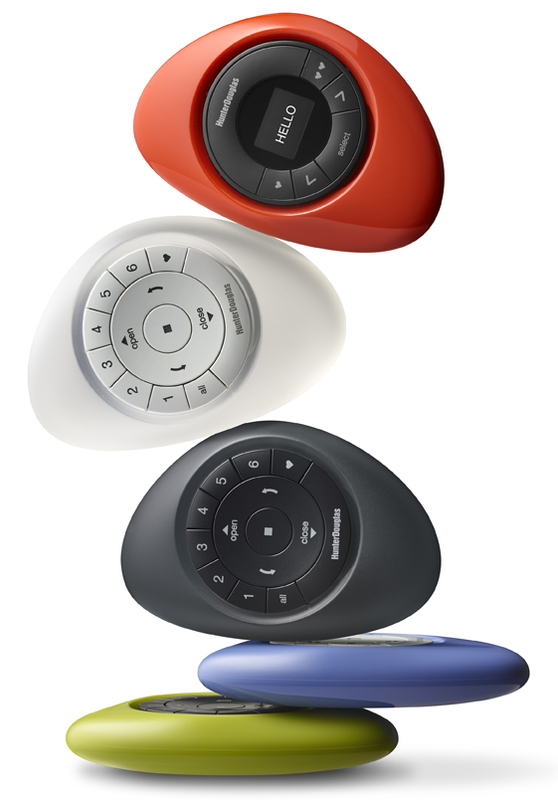 All of these beautiful shades come in a variety of lift systems including the PowerView Motorization from Hunter Douglas. Control your shades with the touch of a button or use the PowerView App! The PowerView App unlocks the full potential of PowerView Motorization. Using the App, you can control your shades with a swipe of a finger. Or, create customized Scenes that move the shades to positions you set, and automate those Scenes to operate on their own throughout the day. Here at Read Design we are more than just window treatments. We are a full service interior design company and our services include home improvement projects as well as remodeling jobs. We do it all from simple painting to new kitchens. Not many folks know about all the services we provide, so we're sharing a recent project we did. It wasn't a big job, but it is always fun to help make our clients homes feel a little bit better than before. 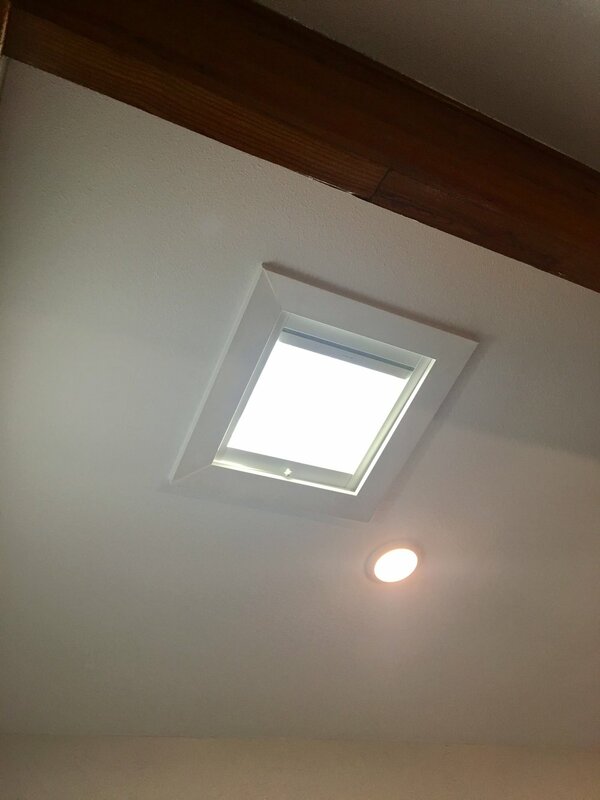 Recently a client stopped by our Southlake store and inquired about a shade to cover a skylight in their home. They asked if we would be able to come out and see their room because they told us “it needed work”. 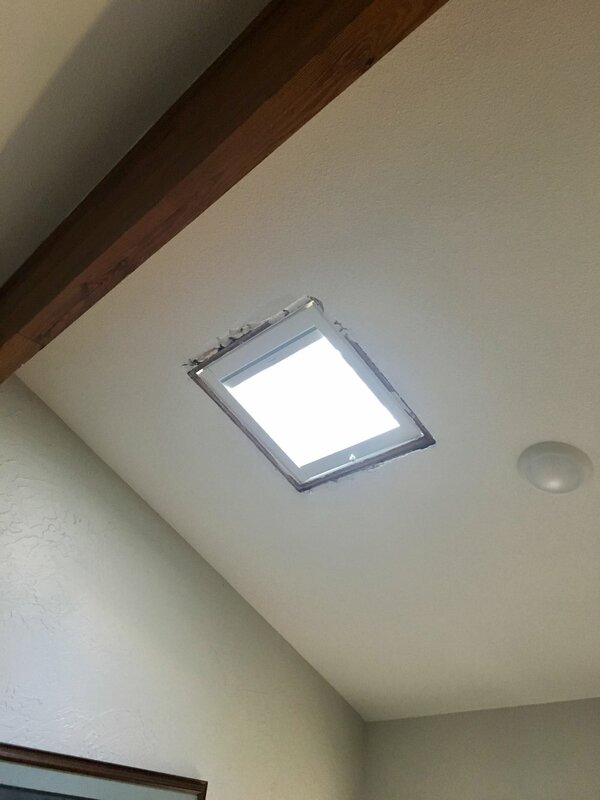 We are always ready to take on a challenge so Jeff stopped by their home and realized that they had put in a skylight but had not finished it out. No problem! We could finish it and make it look great! He suggested that they use the Sky Lift Duette Architella by Hunter Douglas. We would also add PowerView Motorization for ease of operation and convenience. With PowerView, they can purchase the hub and control the shade using the PowerView App! With this app they can set schedules and scenes so the shades move along with the schedule of the homeowner. The Duette Architella is one of Hunter Douglas most energy efficient products and comes in a number of beautiful colors and textures. It is a Honeycomb shade with a cell within a cell creating 3 pockets of air for maximum temperature control. He showed the client the product and they loved it all the features and benefits of it. The project needed a little more work. Jeff and his crew added a simple molding around the skylight that blended in to the ceiling and, well, the finished project speaks for itself. It looks so nice and clean like it was meant to be there from the start. The Duette Architella Shade looks great inside of it as well! We are so happy with the final result. If you are needing help with window treatments, a simple home improvement project, or a total remodeling project, give us a call. Our designers can show you all of the new style and latest trends for homes today! We have exciting news at Read Design, the expansion of Read Design Home (RD Home Collection). New Products are coming in everyday and we are busy in our remodeling mode. Our shop is taking on a new and fun look. Stop in and see us soon! At Read Design Plano, we are a full service Interior Design studio. It all starts with your window coverings. We have a Hunter Douglas Gallery and can show you Blinds and Shades - including Silhouettes, Pirouettes, and many other styles of Shades. And do not forget Plantation Shutters. An attractive window and the right light can change everything - from your room to your mood. Hunter Douglas has mastered the art of window dressing by engineering innovative functions into stylish, versatile looks for every window in your home. Hunter Douglas is the leader in light control, energy efficiency, operation systems and motorization, which makes your home smarter, your days easier, and every room more beautiful. When you stop in make sure you ask for a free copy of our Art of Window Dressing book. Now that the windows are taken care you can move on to softening your windows with drapery panels, cornice or valances. With so many fabrics to choose from we are sure that we can find the perfect solution for your home. We recently helped a customer in Dallas who needed window treatments and more. First we started with Roller shades from Hunter Douglas. The shades are there for sun control and privacy and when they are up, they completely disappear into the headrail. We also added the PowerView motorization options which give give our customer ease of operation. Next we added drapery panels in a navy pattern that coordinates with the new color scheme of her home. They soften the windows and draw out the view to the back yard. For the master bedroom our customer wanted to keep her king size bed. It works nicely in this large room with tall ceilings. 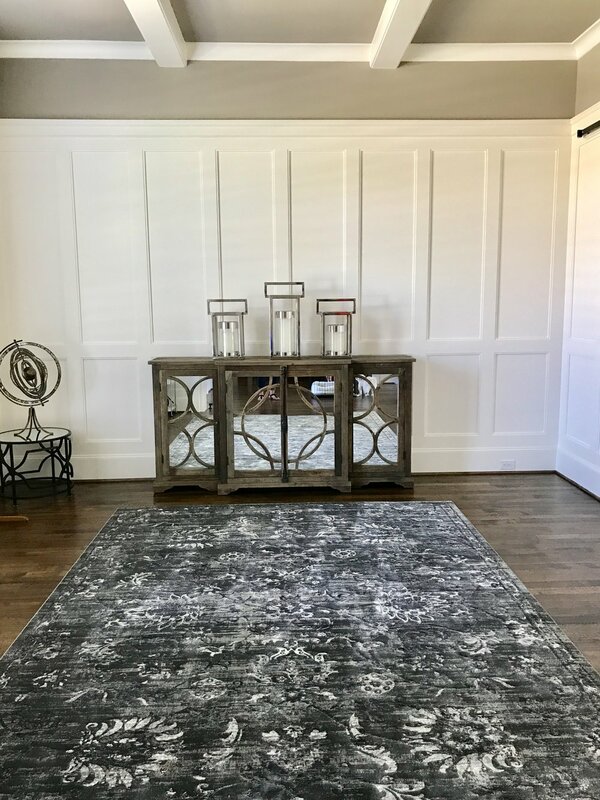 First from RD Home Collection we used a 9’ x 13’ Rug in a contemporary design that brings together the soft grey, silver, and blue colors. We added a blue velvet throw at the end of the bed, blue linen euro shams and 3 custom pillows. All of the fabrics are from Kravet. To finish the look we hung 2 large art pieces behind the nightstands. What you don’t see are the 4 1/2” louver Shutters from Hunter Douglas and 4 drapery panels. The room looks very inviting and comfortable. In her sitting room we selected another piece from RD Home. This is a versatile piece that can be used in a Living Room, Dining Room, or just about anywhere. We also used a large rug to set the tone for the color pattern. We will soon be continuing furnishing this room with chairs and a cocktail table. 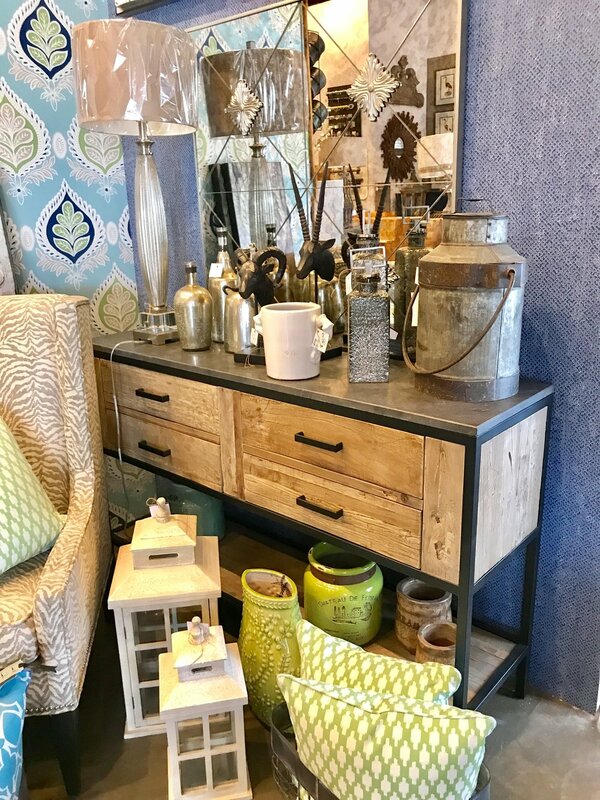 Below are some of the new pieces you will find at Read Design Plano and RD Home. We will continue get new pieces weekly. Or if you would like to have one of our Interior Designers help you with floor planning and design, just let us know. We can put together a Interior Design Plan just for you. 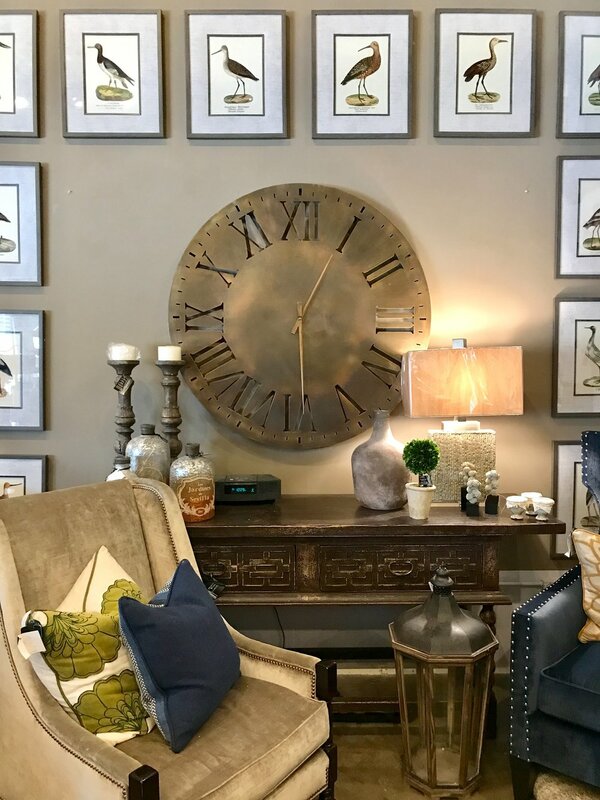 Because we have a ton of furniture in our showroom, we are able to get you a new piece for your upcoming holiday party! We deliver! Give us a call at your earliest convenience to set up your consultation today! PowerView Savings Event Ends September 11! OK. Less than a week left of the 2017 Hunter Douglas Motorization Rebate Event. This past week we completed a beautiful Vignette Modern Roman Shade installation in Plano. All of the upstairs bedrooms face east and have a wonderful view of a golf course. Our client wanted soft window treatments and it was important that the shades operated both top down and bottom up. We selected a textured fabric called Sahara in the Oasis color for two of the bedrooms. For the middle bedroom, including the bath, we used Indian Silk in the Vin Blanc color. All of the Shades are motorized with Hunter Douglas PowerView and can be operated by the Pebble Remote or smartphone. We have attached pictures of the shades and videos of the motorization in process. We all were very pleased with the outcome and our client is looking forward to her motorization rebate from Hunter Douglas. PowerView - As you wish. Choose your level of control. Use the PowerView Pebble Remote - or the wall-mounted Surface Remote - to quickly adjust any single, powered window treatment or groups of shades with just a push of a button. Upgrade to a full smart-house solution. Say Goodbye to lost remotes. Instead, conveniently control your window treatments from your tablet or smartphone. With the PowerView App, you can send shades to specific positions with just the swipe of a finger. Even better? Get the most from your smart shades by creating customized Scenes. Then use the scheduling feature so your shades move automatically to your preferred positions. PowerView does all the work for you - on the days and timeline that perfectly fit your lifestyle. Connect with other smart-home systems. The PowerView system is designed for compatibility with most home automation system technologies on the market today, as well as Apple iOS, Android tablets and mobile devices to expand the function of your wireless home. Please be sure to visit the PowerView Compatibility page at hunterdouglas.com for the latest information on compatible systems and devices. Smart Connections beyond the Window. Today's connected home is more advanced and easier to control than ever before with PowerView Motorization, your home's window treatments are part of this convenient technology, delivering the connected lifestyle you demand - right from the smart devices you use every day. PowerView works seamlessly with the leading Connected Home providers including Nest, Apple HomeKit and Amazon Alexa. Call us to learn more about these amazing features! Unlike most electronic products which are typically covered for one year, Hunter Douglas motorized components are covered for five years from the date of purchase. The stylish and colorful handheld Pebble Remote or the Wall-mounted Surface Remote puts direct adjustment at your fingertips. Operate individual or groups of shades with the push of a button. Customize your collection of Rooms and Scenes with the App, then use the scheduling feature to operate them whether your are home or away. It is designed for compatibility with Apple, iOS, and Android tablets and mobile devices. When your tablet or smartphone isn't handy, the Scene Controller works seamlessly with the PowerView Hub and App to trigger the Scenes you have created, adding even more convenient control. Our elegantly designed Hub connects wirelessly to your home WiFi network. It is the central point of control for all your home's PowerView window treatments, storing your settings and activating your Scenes. The Repeater is a small signal enhancer that discreetly plugs into almost any outlet to extend signal range and carry commands throughout your home. It also provides customized lighting day and night via its illumination features. Those are the members of the PowerView Family only from Hunter Douglas. So as you wish, choose your level of control. Use the PowerView Pebble Remote or the small-mounted Surface Remote- to quickly adjust any single, powered window treatment or groups of shades with just a push of a button. Say goodbye to lost remotes. Instead, conveniently control your window treatments from you tablet or smartphone. With the PowerView App, you can send shades to specific positions with just the swipe of a finger. Even better? Get the most from your smart shades by creating customized Scenes. Then, use the scheduling feature so your shades move automatically to your preferred positions. PowerView does all the work for you--on the days and timing that perfectly fit your lifestyle. The PowerView system is designed for compatibility with most home automation system technologies on the market today, as well as Apple, iOS, and Android tablets and mobile devices to expand the function of your wireless home. Please be sure to visit the PowerView Compatibility page at hunterdouglas.com for the latest information on compatible systems and devices. Soon we will be talking about a Day with PowerView and also Motorized Drapery Treatments. But for now stop in and see all of the displays at Read Design Plano or Read Design Southlake.If you are building a New Home or are in the process of redoing the home you live in,give us a call.Our designers can help you find the look that is exactly your style.They are familiar with all of the products, fabrics and colors.If you are interested in going a step further with Drapery Treatments, they can assist you there also.We have fabrics from all of the major companies and more.We would love to help you.Also ask for a copy of the new Art of Window Dressing Book. PowerView Motorization in Prosper and Colleyville.We also service Dallas, Plano, Southlake, Grapevine, McKinney, Allen, Keller, Fort Worth, Celina, Lantana, Robson Ranch, Carrollton, Highland Park, Richardson, Trophy Club, North Richland Hills, Lewisville, Flower Mound, and all areas inbetween. See our Luminette Privacy Sheers in operation with the PowerView Motorization System from Hunter Douglas. We used the PowerView App on this customers iPhone to open and close these beautiful shades. From now until September 11, Read Design Plano and Read Design Southlake will host a number of Motorization Events including 2 Thursday "Wine and Design" nights focusing on PowerView Motorization by Hunter Douglas. There will also be Exclusive Promotions, Coupon Giveaways , and a drawing at each Store for the Brand New PowerView Hub. Stop by and you will also receive the New Art of Window Dressing Book! So lets get in to it......... PowerView Motorization! With PowerView Motorization from Hunter Douglas, the worlds most beautiful window treatments are now the most intelligent. This innovative wireless system lets you move any powered Hunter Douglas window treatment according to the schedules you set. Perfect lighting, energy efficiency, everyday convenience - its all delivered automatically with PowerView. It's technology at your service. Use PowerView Motorization to move your shades according to the sun's daily patterns. Having your shades in the right positions can reduce solar heat gain in the summer and heat loss in the winter, and could help you lower your energy bills. Adjust your shades for added security while you're away via the RemoteConnect feature on your smartphone or tablet. Most PowerView window treatments are battery powered, so they're easy to install, operate, and maintain. The battery pack is hidden behind the head rail, so there is nothing to mar the beauty of your window treatments. *Wired window treatments are available - ask us how! But now if you are buying a new home or if you are making improvements to your current home, stop by either Read Design Plano or Read Design Southlake and let our qualified designers show you all of the Window Shadings that can be powered. We can show you fabrics that will work with your life style and give you ideas on how to set your scenes. We can show you the latest trends and current styles. We are a Family business and are excited about all that is new with Hunter Douglas PowerView Motorization. The joy of Great Design. At Hunter Douglas, we believe your window fashions should bring you the greatest possible enjoyment, adding beauty and style to your home. That is why we're passionately driven to design our products with a refined sense of style and industry-leading innovation. So when you choose the Hunter Douglas brand, you can be sure that high quality, beautiful window fashions decorate your home for many years to come. Everything is designed to be seen, touched, experienced and loved. An update on classic honeycomb shades, Sonnette Cellular Roller Shades gently diffuse light through an innovative curved shape; providing ambiance and character while dispersing light to all angles of the room. Experience the new shape of light. Purposefully engineered, our curved cellular construction provides and energy efficient layer to your home. Insulation in the winter and cooling in the summer. After decades of industry experience, we've taken the best features in window fashions to create a versatile easy to use, contemporary window treatment - perfect for any room in the modern home. Semi-opaque diffuses light for a soft glow and moderate privacy from the outside in. Room darkening blocks the majority of incoming light and provides additional in home privacy. LiteRise - raise to lower your shades by lifting up or pulling down on the bottom rail. Soft Touch Motorizations - gently pull down on the wand to activate your shade to lower it and a slight push up on the wand will send your shade into the full raised position. This motorized system has a favorite position functionality and it battery powered. *Not compatible with PowerView or App. Poweriew Motorizations - create personalized shade settings called Scenes, then set those scenes to schedules for the ultimate convenience of automated operation. Operate your shades from home or while you're away via the RemoteConnect feature. Battery powered and plug in options are available. Easily intergrate PowerView with connected devices and third party automation systems (Amazon Echo, IFTTT, Nest and more) for the whole home experience. See and experience Sonnette Shades during our early launch only at Read Design Plano and Read Design Southlake. You can feel, operate shade samples and look at fabrics for this new and innovative shade. Our designers will show you all of the options. It is clear that we are very excited about this new product! Stop in today and let us know what you think! See Sonnette Shades at Read Design Plano and Read Design Southlake. We travel to all of the following areas and more: Fort Worth, Rowlett, Dallas, Prosper, Celina, Frisco, Colleyville, Coppell, Robson Ranch, Plano, Southlake, Irving, Grapevine, Flower Mound, Denton, Highland Park, Lakewood, Allen, McKinney and everywhere in between!